The large capacity Open Top Trash Can is an ideal choice for a small business and high traffic areas such as coffee shops, repair shops, lobbies, offices, and more. With an extra large top opening, and easy lift lid, this trash can is simple, effective, and efficient. The finger-print-proof high grade stainless steel looks great in any environment. The non-skid rubber bottom ensures the can will stay in place. This 60 Liter Dual-Deodorizer Round Open Top Trash Can is the perfect size trash can for lobbies, dining areas, stores, or any high traffic venue. It features a large open top with an easy to clean cylindrical fingerprint-proof brushed stainless steel body design that allows it to fit easily into any space and easy to keep clean. It also includes two activated carbon filters designed to keep odors out of the surrounding area. The wide opening easily accommodates large and bulky items. Its 60 liter / 16 gallon capacity can easily retain more than a day's worth of trash. Its elegant, brushed stainless steel finish is smudge-resistant, easy to clean, and complements any setting. 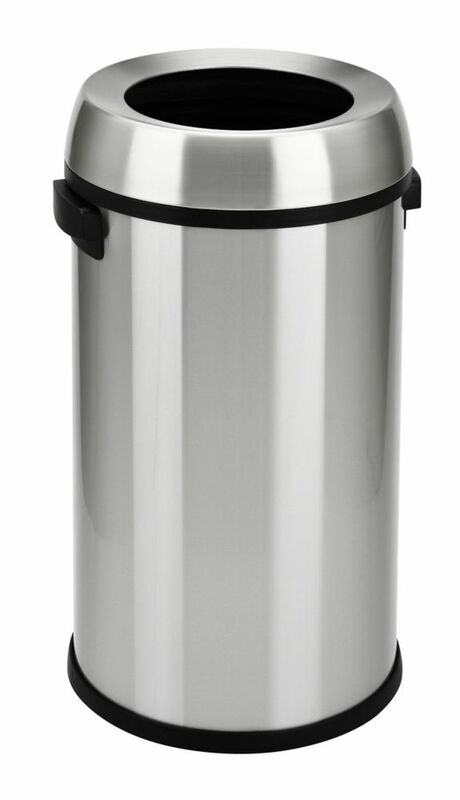 Honey-Can-Do TRS-01198 52L Motion Sensing Trash Can, Stainless Finish. Make garbage less of a mess with this convenient motion sensing touchless 52L trash can. The motion-activated lid automatically opens and closes, keeping your hands away from any lingering germs. If needed, the lid can also open with the push of a relative button. The can is battery operated, allowing it to be placed away from precious electrical outlets. An optional a/c adapter is available. Requires 4 D batteries for battery operation, not included. Honey-Can-Do TRS-01200 Large Capacity Motion Sensing Trash Can, Stainless. Make garbage less of a mess with this convenient motion sensing touchless trash can. The motion-activated lid automatically opens and closes, keeping your hands away from any lingering germs. If needed, the lid can also open with the push of a relative button. The can is battery operated, allowing it to be placed away from precious electrical outlets. Requires 4 D batteries, not included. 65L Open Top Trash Can The large capacity Open Top Trash Can is an ideal choice for a small business and high traffic areas such as coffee shops, repair shops, lobbies, offices, and more. With an extra large top opening, and easy lift lid, this trash can is simple, effective, and efficient. The finger-print-proof high grade stainless steel looks great in any environment. The non-skid rubber bottom ensures the can will stay in place. 65L Open Top Trash Can is rated 5.0 out of 5 by 1. Rated 5 out of 5 by autogal from Exactly what I was looking for. I use this in my office and am very pleased with the purchase. Pr... Exactly what I was looking for. I use this in my office and am very pleased with the purchase. Price is right!